Encounter the #EptaExperience on Epta's Asia Pacific stand at Thaifex - World of Food Asia, scheduled to take place between 31 May and 4 June in Bangkok. This is the largest event for the ASEAN economic community of the Food&Beverage, technology and Retail sectors that will involve the participation of more than 45,000 visitors and 2,000 Companies from all over the world. 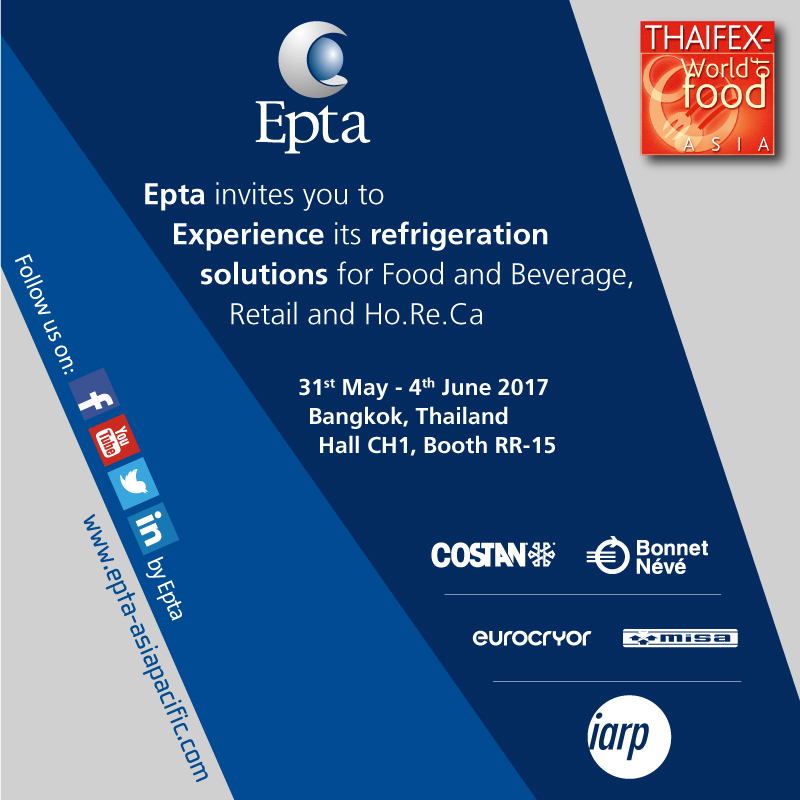 Epta will be attending Thaifex, an important showcase for the operators of the food sector, with its brands Bonnet Névé, Eurocryor, Misa and Iarp that offer solutions dedicated to a constantly evolving market with high growth rates of approximately 11%. * (Hall CH1, stand RR-15). In order to respond to the requirements of the F&B industry and the Retail sector in this region, that is increasingly focused on food safety and a better presentation of foodstuffs, Epta will be presenting some of its flagship solutions, that are the result of the exclusive #EptaExperience. This is the strategy with which the Group has restated its capacity to combine state-of-the-art technology, innovation and expertise in the tailor-made design of its brands systems in order to offer Customers in stores an original and engaging experience. The new product range includes the Joy semi-vertical plug-ins and the Delight scooping from the Iarp Emotions Range as well as the New York vending machine for ice-creams from the Iarp City Collection. These two ranges are characterised by a design with elegant and high-tech forms, that contribute to attracting the attention of consumers towards the products on display and incentivising impulse buying. An additional distinctive trait of the two lines is the huge possibility they offer in terms of the personalisation of layout, thanks to the new digital printing straight onto metal sheets. To promote maximum energy efficiency combined with the use of natural refrigerants, Epta offers the EptaBlue CO2 solution that enables normal and low temperature cabinets and cold rooms to be equipped with an on-board refrigeration unit, to transform them from remote cabinets to plug-ins, by exploiting a water circuit. This solution is 100% natural and completely integrated with the store’s HVAC system that was designed by Epta to respond to the requirements of small and medium stores to limit energy consumption, reduce the installation complexity of refrigeration systems, while guaranteeing an excellent return on their investments.